← Quilts, and women, with a history! About four months ago, we adopted an adorable 2-month-old YorkiePoo who we named Jazzy. Until about 10 years ago, I always had dogs, and have loved every one of them dearly. Then the last of my beloved pugs, Cozie, died, and Karen and I started traveling more, so having a dog did not seem reasonable — until now! And what an experience it is! As with almost everything else in life over the past 10 to 15 years, dealing with a puppy now is vastly different from what it was back then! There actually is a considerable volume of “evidence based literature” that teaches new dog owners effective ways to train a puppy, and how to live with a dog. And for the first time in my experience, I am living in a high-rise apartment building, so for the first time I am learning about “puppy pads” instead of a fenced yard! So within a week of introducing Jazzy into our household, off we went to puppy kindergarten at the Berkeley Humane Society! Jazzy excelled at recess! She did have a few “problems” — she hated .. HATED … being restrained in any way, and used her mighty voice to let everyone know that she very much preferred to be free and playing with the other puppies. Other puppies in the class had quirks as well, but none quite as annoying as Jazzy’s insistent barking. At first I was afraid that Nancy, the teacher, would ask us to leave. But instead, Nancy patiently stayed focused on the experience of the class for everyone, and occasionally took the opportunity to use Jazzy to show the class certain ways of dealing with particular types of behaviors. And Jazzy, like all of the other puppies, responded instantly to Nancy’s expert hands and voice. Needless to say, we learned heaps in the experience, and Jazzy is a much better companion than she would be otherwise. 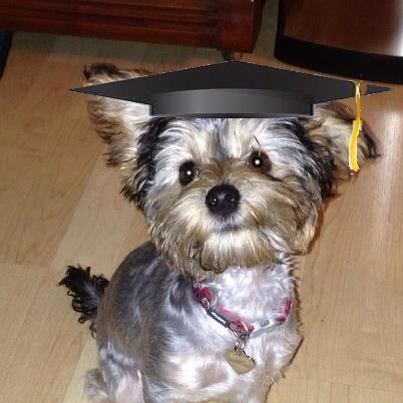 But there is one lesson that I learned in puppy kindergarten that had nothing to do with the “curriculum” per se. Nancy modeled total acceptance and respect for every single dog in the group. I kept thinking that surely she had personal preferences for certain dogs over others (I do! ), and surely she must have been quite annoyed with certain behaviors (like Jazzy’s barking). But if she had any of these kinds of preferences or annoyances, I did not feel it, and I suspect the same is true for others in the class as well. Nancy accepted each dog for the particular canine creature it is. She equally accepted all of us rather inept humans. When she saw a human behavior that needed “correcting” she explained what needed to change and why, and patiently worked with us as we struggled to become effective companions for our puppies. Nancy commented several times about the “little Yorkie” traits (that Jazzy is so expert at displaying) in a tone that was respectful and accepting of what is – not a judgmental tone one way or another. Likewise, she explained traits of other breeds, such as German Shepherds, and the misconceptions that humans carry about certain of these breeds. Of course Nancy would have to be a dog lover to do the work that she does as a trainer, but her demeanor went far beyond the sentiment of “dog lover” to a well informed and knowledgeable unconditional regard for every doggie creature she works with. What an important lesson, to me, for life. I came away from puppy kindergarten with a new appreciation of what it means to live in the world with unconditional regard for others – the most challenging of whom are fellow human beings! It was an inspiring experience, this puppy kindergarten. I wished that our human experiences could start, in kindergarten, with learning this vital skill for life! But of course it is never too late, and even in my 70’s, I learned heaps about what is possible in the world – in puppy kindergarten! This entry was posted in Reflections, Social Issues, Uncategorized and tagged Berkeley Humane Society, peace, puppy kindergarten, unconditional regard. Bookmark the permalink. Ah a heart warming story. We live in an appartment that doesn’t allow dogs and I really miss my last dog; a lovely King Charles Caviler Spaniel (Bunty). As you say re: re most everything changing (you DO love your crate, Jazzy!!! ), city life, particularly with dogs, just gets more and more fun! Jazzy definitely would win best bark!! And well … she screeches when we put her in her crate … at least for a few minutes!! Not sure I would call that love exactly!!! Great to hear from you, Sue! Loved reading this. We are never too old to learn again and again. Thank you!! I love this Peggy and I love you and Karen have Jazzy. I suspect that the true teachers in this story are the dogs. It’s that unconditional love thing. They actually love you more when you give them direction and they make you happy! levels but it is true that they have so much we can learn from. Love to you and the wonderful dogs in your life! HI I love your comments about puppy kindergardent and unconditional love and respect. What a lesson we all can learn form that place!!!. As for being seventy…who in the world would know it.! You have the joy and enthusiasm of an immortal!! and the beauty as well. Anyone who can do quilts like you sees the perfection in all things, and that includes loving our neighbor as ourself.